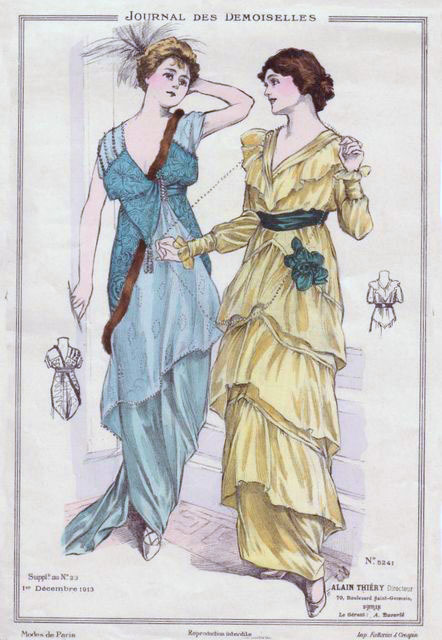 Today we have two dresses from Journal Des Demoiselles, 1913. This period was the birth of the modern era. Hems were slowly rising and, in some ways, garments were becoming less restrictive. The fashionable dress had a high empire waist and a straight, narrow skirt. Embellishments were key and details were ultra-feminine. Asymmetry was all the rage, as were designs inspired by the Orient. The blue gown on the left appears to be an evening dress due to its low V-neckline and barely-there kimono sleeves. It’s cut asymmetrically, with a sheer diagonal overskirt and a short train. There’s a band of brown fur that runs diagonally over the shoulder and around the hip, like a sash. She wears no jewelry, but has a feathered hairpiece. The yellow dress on the right appears to be a day dress, owing to its long sleeves. It has a low, surplice neckline that’s edged with a wide ruffle. The sleeves are long, gathered into wide cuffs, with a ruffle at each wrist. The bodice is loose and full, reminiscent of the pigeon-breast style of the turn of the century. While the skirt is narrow, it’s layered with several inverted V-shaped ruffles that add fullness. She wears a wide dark blue sash and a matching flower at her hip. She also sports an extremely long pearl necklace. This entry was posted in Friday's Fashion Plates and tagged Edwardian, Fashion Plates, Friday. Bookmark the permalink.